Last night was all about procrastination. I was avoiding homework for a work course I attended today. And also avoiding several quilt tops that need to be quilted. 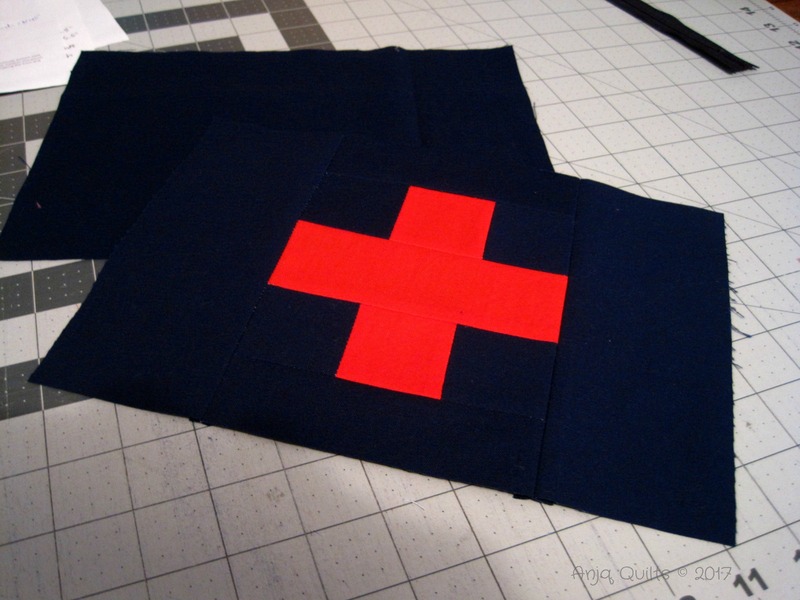 But I felt like sewing a little something. So I decided to dig through my scrap bag (aka pile on the floor) and make a little something for Scraptastic Tuesday hosted by She Can Quilt. On Christmas Eve, my brother commented that he didn't have a band-aid when he cut his foot the week before. He just recently moved out (yet again....have lost count how many times he's moved out and moved back in) from my parents' house. 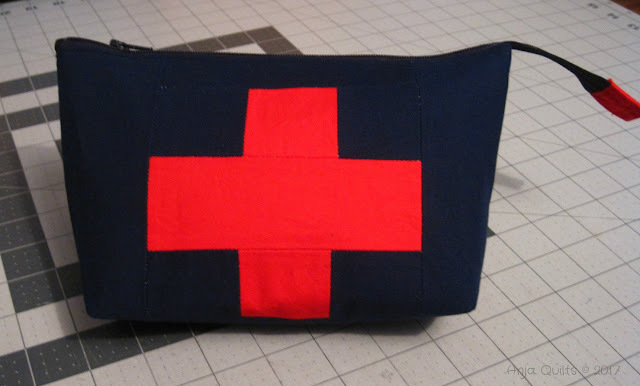 So I thought I could make him a little first aid kit. 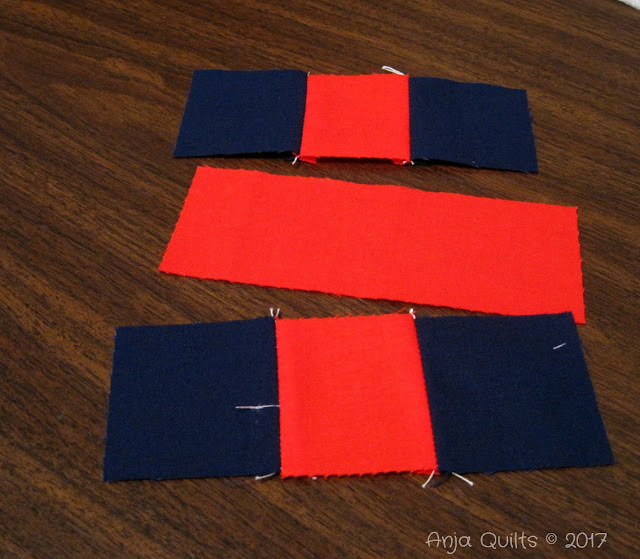 Found enough dark blue for the two exterior pieces and some red for the cross. 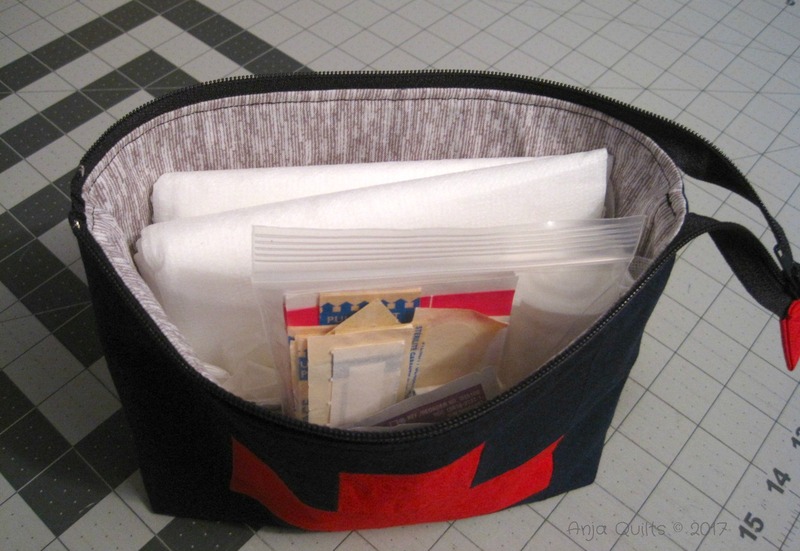 Noodlehead's Open Wide Zippered Pouch is my favourite pouch pattern. But I was making it up as I went along (which is never a good thing) so the cross ended up being too big, and the bottom part is hidden when the pouch is full. Oh well..even though the fabrics were from the scrap pile, I wasn't prepared to toss it and start again. I was able to stock the pouch from my first aid box (yes, I have a box of first aid supplies...I am a Girl Guide after all). I made the small size, but realize that the medium size would have been a better choice. Absolutely adorable! I had a first aid box whenever I lived away from my parents, courtesy of my momma. :) I keep meaning to check out the Open Wide Pouch pattern, I've heard such good things about it. What a thoughtful gift! The pouch looks great and well stocked. What a great idea and it turned out great! But no orange? What a great idea, and I hope your brother appreciates it! It's a pretty little finish Anja. Fab idea! Everyone should have one. 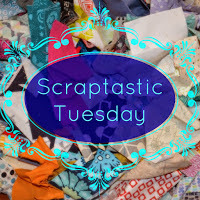 Thanks for linking up to #scraptastictuesday! Have you gifted it yet?? What did he say? Great pouch! Will have to check out that pattern! Anja, I can tell that you have a creative side! I never would have had the creativity to come up with something like this. My wife would absolutely love to make something like this so I will make sure she reads this post. As always, you never disappoint! Thanks again!